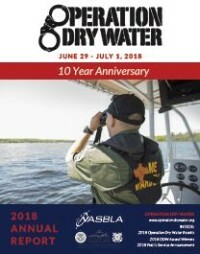 The 2018 Operation Dry Water annual report summarized this year's enforcement, outreach and awareness activity. The campaign also celebrated its 10th Anniversary in 2018. Check out the annual report to see how far the campaign has come and what went on in 2018! The annual report includes law enforcement results, analyzes media exposure, reviews the growth of the campaign over the past 10 years and much more. Operation DryWater (ODW) is a year-round boating under the influence awareness and enforcement campaign. The mission of ODW is to reduce the number of alcohol- and drug-related accidents and fatalities through increased recreational boater awareness and by fostering a stronger and more visible deterrent to alcohol use on the water. The Operation Dry Water heightened awareness and enforcement weekend takes place over the Friday - Sunday closest to the July 4th holiday. This holiday is known for a significant presence of boaters on the water and unfortunately, a heightened number of boating accidents and fatalities related to boating under the influence. To learn more about Operation Dry Water visit www.operationdrywater.org. Click here to view the 2018 Operation Dry Water Annual Report.